Weight-based shipping Define shipping prices depending on order weight, destination and subtotal. Shipping classes Set shipping costs per specific shipping classes individually. Shipping zones Perfectly supports WooCommerce Shippping Zones as well as global shipping configuration outside of shipping zones. Conditional free shipping Set up shipping options to show for orders reaching specific subtotal threshold, weight or going to specific destinations. 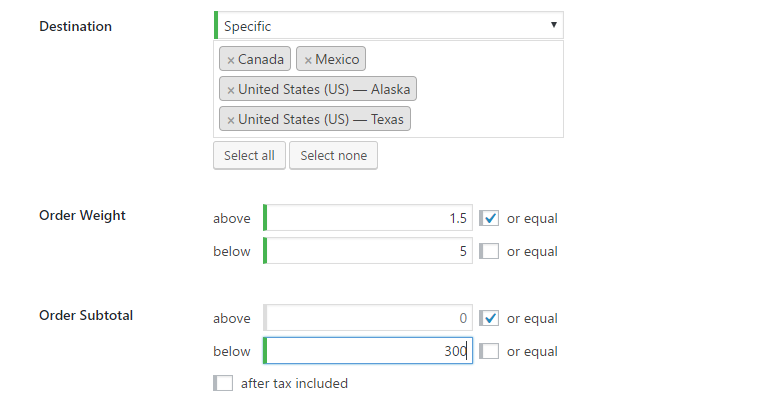 Define shipping prices by creating rules for each different case you have. Each rule can be set up to activate on certain order destination, weight or subtotal. All conditions are optional. Define flat shipping price or progressive weight rate or both. You can override shipping prices for specific shipping classes. You can set minimum and maximum shipping price constraints to make sure it's sane in any case. © 2019 Weight Based Shipping for WooCommerce. Plugin requires PHP 5.3+, WordPress 4.0+, WooCommerce 2.3+.